Feiwel & Friends, 9780312561567, 112pp. Moving is tough. Being the new kid in school is even tougher. But the hardest thing of all about the move that Doreen "Dodo" Bussey's family is making is that she suspects it might be because of her. She got into trouble at her last school. On the drive to their new home, her mother gives Dodo a blank notebook, which she uses to chronicle the move, the first days in a new city, and the ups and downs of starting a new school and making new friends. 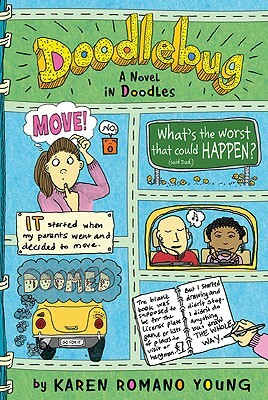 In the process, she reinvents herself as the Doodlebug. Her little sister seems to adjust to everything so easily why is it so hard for Dodo? KAREN ROMANO YOUNG (www.karenromanoyoung.com) is the author of over a dozen books for children, both fiction and nonfiction, including "The Beetle and Me: A Love Story, "which has won several state awards, received starred reviews from "Kirkus Reviews "and "Publishers Weekly, " and earned her a "Flying Start" in "Publishers Weekly." She lives in Bethel, Connecticut, with her family.